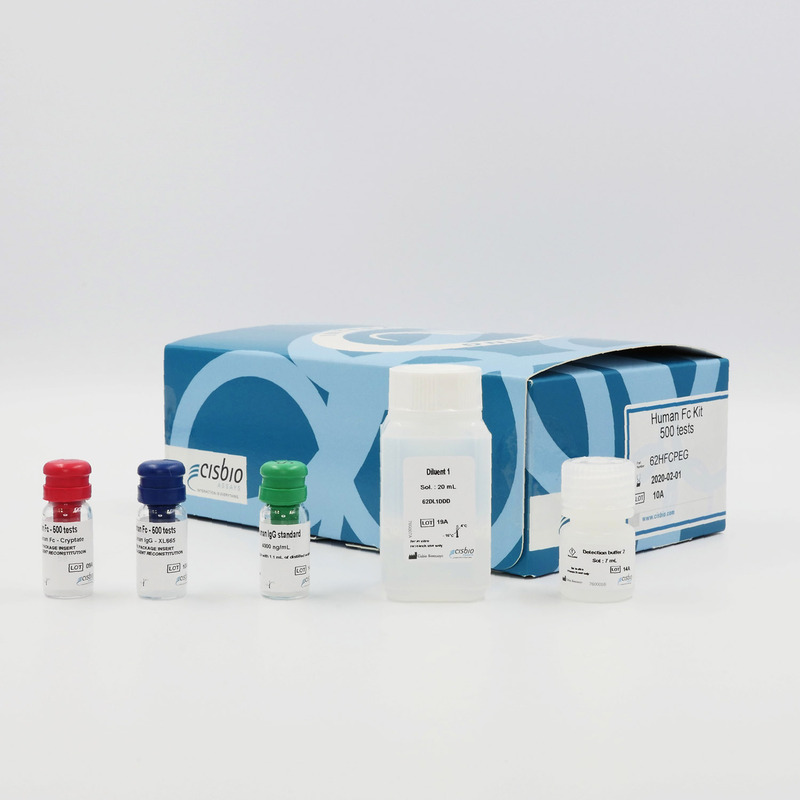 The Human Fc kit is designed for the fast quantification of human IgG or Human Fc tagged proteins. Drug discovery and bioprocess often require accurate quantification technologies to improve the productivity workflow. Current methods such as ELISA do not properly fit with such objectives as they require multiple sample-handling and protocol steps. The human Fc kit enables a rapid quantification of human IgG, and any proteins containing a human Fc region. The assay is compatible with natural IgG as well as recombinant antibodies. The human Fc kit is a competitive immunoassay for the measurement of hIgGs or any hFc-tagged proteins in a range of biological materials. The assay uses an Eu3+-Cryptate conjugated antibody specific to hFc and XL665 coupled hIgGs. hFc provided by the sample competes with XL665-labelled human IgG for binding to anti-human Fc Eu Cryptate. The human Fc assay features a streamlined protocol with only 1 incubation step after sample and Human Fc detection reagents dispensing. This protocol requires a single 2-and-a-half-hour incubation period at RT. Human Fc chimeric antibodies as well as proteins containing a human Fc region can be detected using the HTRF human Fc assay. As shown in Figure 1, the affinity depends on the nature of each Fc chimera and is at its maximum for whole IgG. This means that the assessment of the concentration can be made on a relative basis using the human IgG calibrator. Absolute concentration can be approached if the calibrator is made with the same protein as that being assessed. Figure 1: Various concentrations of four different human Fc chimeras were tested using the Total human IgG assay, following standard assay protocols. Figure 2 demonstrates the compatibility of the HTRF human Fc assay with different media, even in the presence of 10% FCS. No impact on assay performance was seen. Unlike other immunoassays involving streptavidin-biotin detection, this assay is insensitive to the presence of culture medium, whose quenching effects can be compensated for by our patented 665/620 ratio. Figure 2: IgG standard curve was drawn up using IgG in phosphate buffer, culture media and RPMI containing 10% FCS+/- 4.4% PSGHT (Penicillin, Streptamycin, Glutamine, Hypoxanthine, Thymidine).